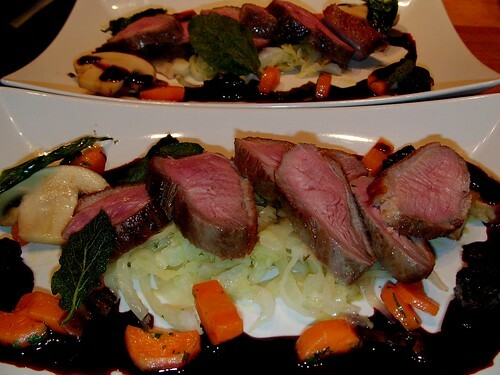 Venison and Blackberries last year ! Cheese and charcuterie for Sunday lunch!! Confit goose legs make a great cassoulet with homemade Toulouse style sausage, pork , beans , goose , carrot and onion a few smoked bacon lardons and some garden herbs. Just roasted and delicious . All the best for thew new year folks and here we are back again after a looong break and hoping to add to and keep this blog rolling along now . 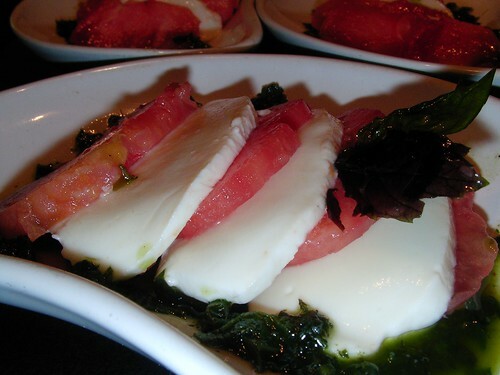 Lots of food eaten and places visited to see and great artisan foods to try ! Heres a magret of duck to enjoy , Duck ham as it is sometimes called , a week in maldon salt to remove some liquid and stabilise the meat and then spice and air dry for a few weeks . Slice it wafer thin with figs or apricot slices . 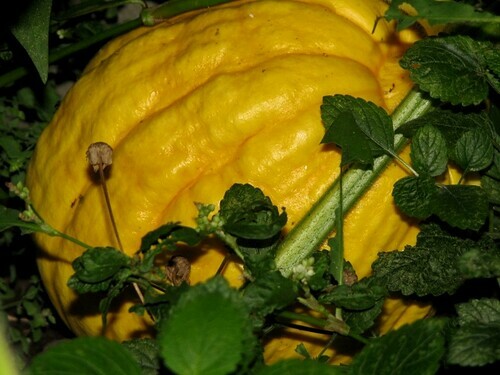 The mighty pumpkin is still growing, a photo by rustumlongpig on Flickr. Always good to have a pumpkin growing! 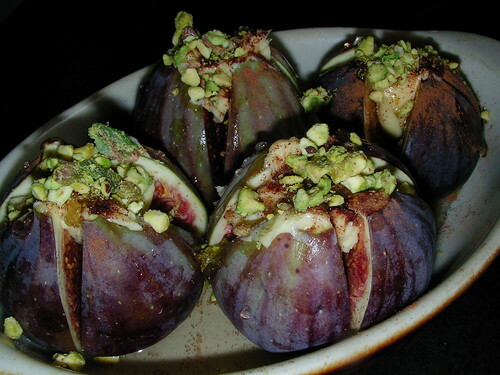 Loaded figs awaiting the oven, a photo by rustumlongpig on Flickr. Beef tomatoes and basil leaf, a photo by rustumlongpig on Flickr. Duck, a photo by rustumlongpig on Flickr. 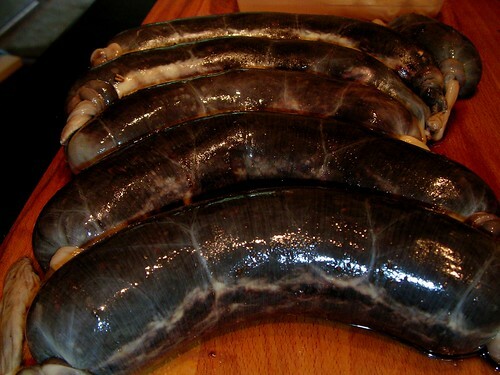 Black puddings, a photo by rustumlongpig on Flickr. black pudding awaiting string and a little cooking. Hand made and really good I know what went into them so all is well . 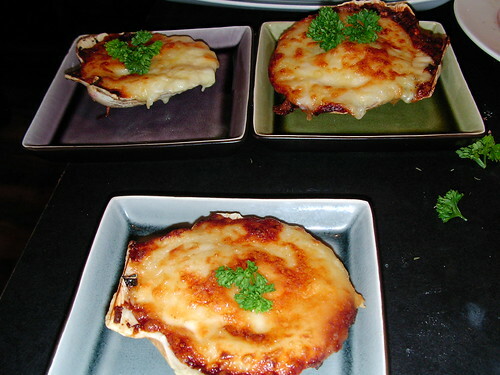 Scallops gratinee, a photo by rustumlongpig on Flickr. boned and rolled, a photo by rustumlongpig on Flickr. 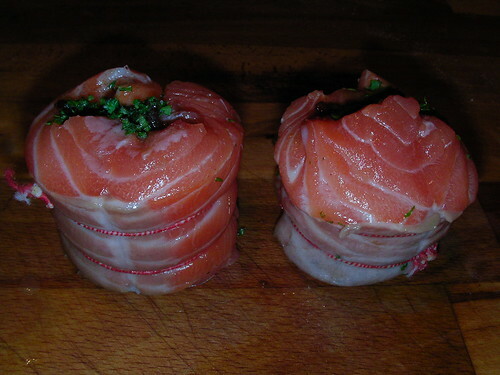 Salmon boned and rolled with fig chutney and parsley--12 mins at 60oc. Cod, a photo by rustumlongpig on Flickr. 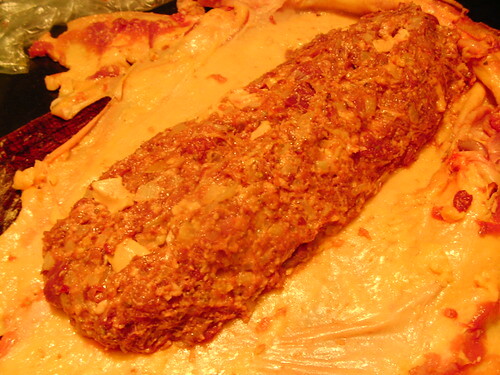 Sauce and parmesan crisp, a photo by rustumlongpig on Flickr. Cant have a thermidore without parmesan cheese. 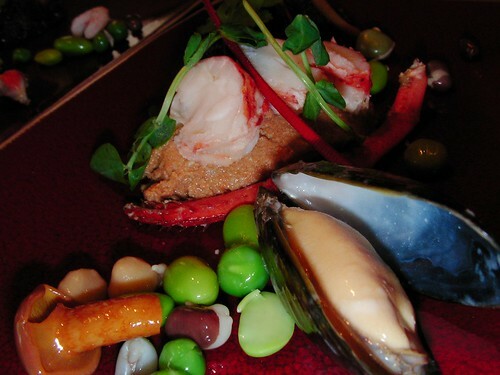 Lobster thermidore starter, a photo by rustumlongpig on Flickr. 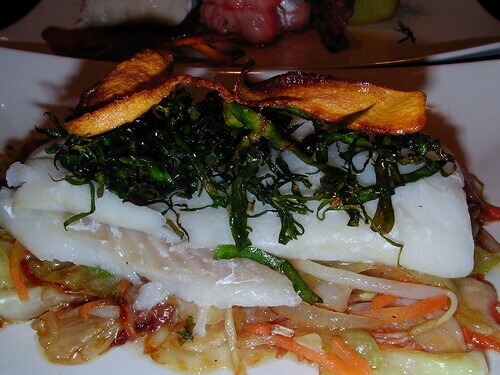 Battered cod chips and marrowfats, a photo by rustumlongpig on Flickr. Cant beat cod and chips with a nice crispy batter , And the best tartare sauce. 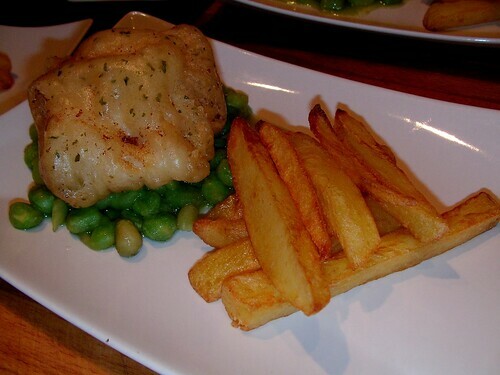 Cod without batter thrice cooked chips. 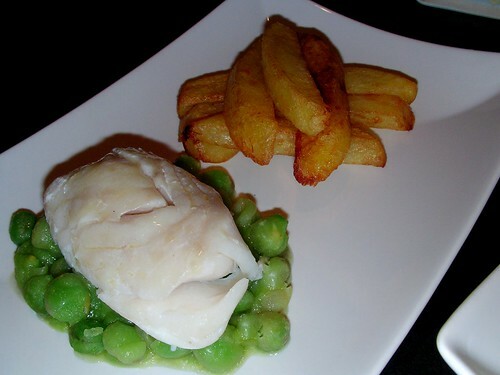 Cod without batter thrice cooked chips., a photo by rustumlongpig on Flickr. Keep it up George and give the breweries and drinkers a break, here's to you!!! 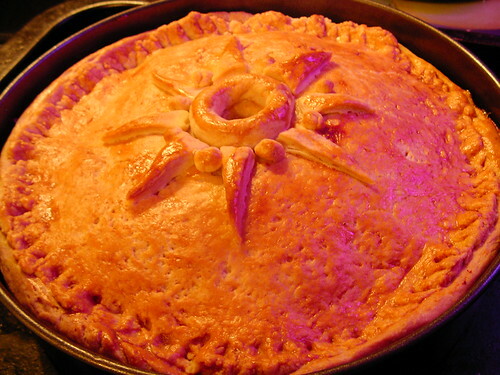 Big pork pie, a photo by rustumlongpig on Flickr. This was a Christmas present for my cousin. When they returned from the pub that night this lasted five minutes! 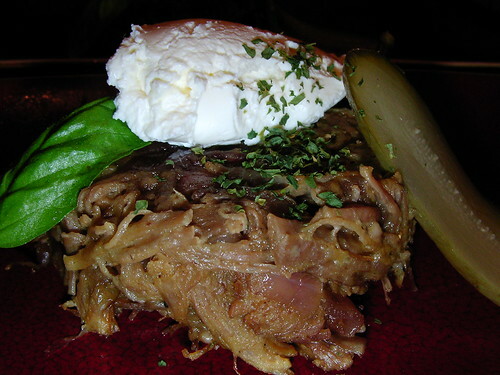 Leg of Duck confit, a photo by rustumlongpig on Flickr. Magic mushrooms., a photo by rustumlongpig on Flickr. 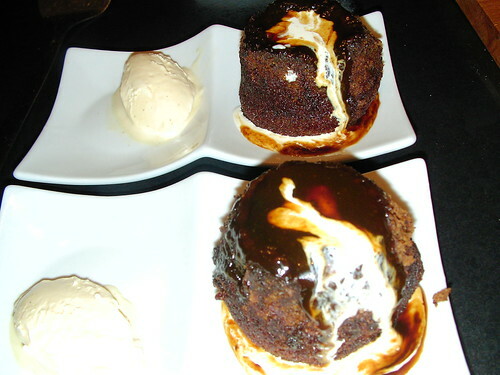 Sticky toffee pudding, a photo by rustumlongpig on Flickr. I paired this with a pony of draught Guiness which worked a real treat--try it . 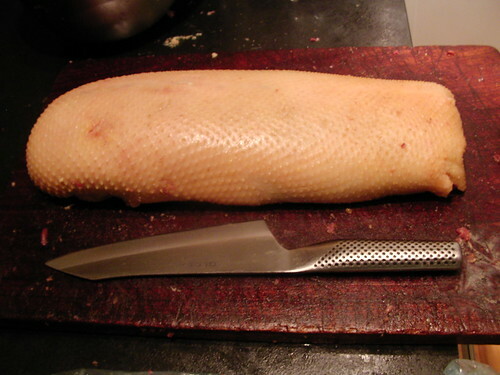 Cold Goose ballotine, a photo by rustumlongpig on Flickr. The goose process got a bit disjointed but here is the cold version with the foi gras visible. I wanted a little truffle in there but alas at the time no truffle available. chicken parfait, a photo by rustumlongpig on Flickr. 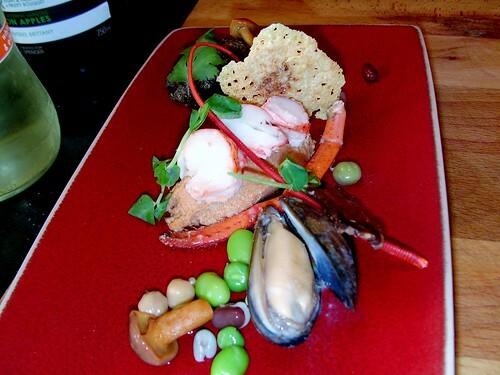 Heres the Monro chicken parfait. As I said---nearly as good as mine! Chinese New Year - Duck, a photo by The Monro Group on Flickr. Here's one from a favourit waterhole The Monro in Duke St Liverpool. 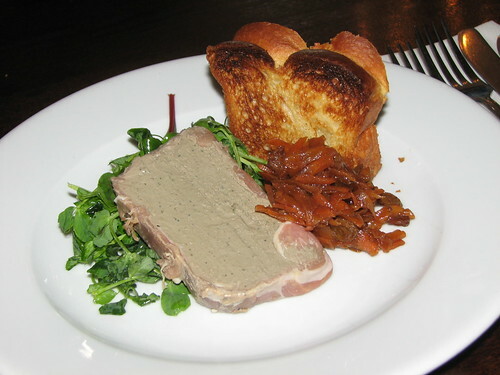 I had their chicken liver parfait yesterday and its almost as good as mine. Potted brisket & cornichon, a photo by rustumlongpig on Flickr. Rillettes of salt beef and onion with sea salt and coarse peppers served with a slice of toasted baton and English mustard. Horseradish créme fraich for spreading on your toasty. 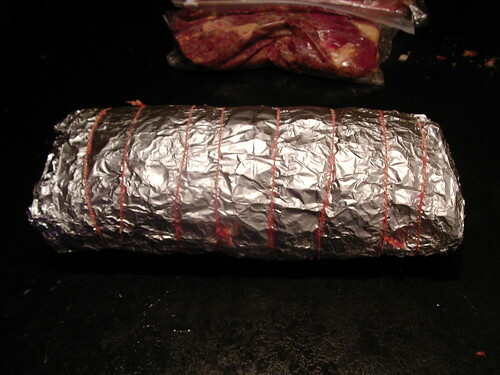 Goose rolled and filled with the macerated legmeat, a photo by rustumlongpig on Flickr. 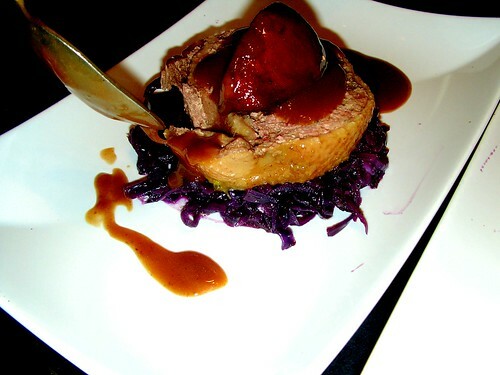 The braised red cabbage bed contained red onion and cranberry jelly, the jus was a concentrate of roast bone juices and port. the cinnamon apple was a bramley. If I would alter anything perhaps I would be a little less cavalier with the sage. Sage can overpower the subtle flavors present here. I have no beef with this!! The big supermarkets are , at long last , declaring an interest in British Meats instead of combing the planet for the cheapest and as it turns out , dubious products. Now while this is to be applauded , they needed the Horsey scandal to push them into it or we would be still getting "Various animals" minced into our foodstuffs. The second caveat is the example of the strangulation of our dairy industry which has decimated our milking stock and threatened cheese production throughout the land , Beef producers beware! We already see security tags on the humblest cuts of beef and recently I saw a ticket on a lamb chop reading "This joint , £1.89." Strange days indeed!! I feel that the inclusion of gelatin in products is one way that horse (and other) DNA could be identified in goods from jelly's to pork pies as gelatin has , traditionally be made by rendering hoof bone and cartilaginous matter , a bit like a highly concentrated stock , to produce the sheets or powders we have been happily using without difficulty for years. I render pigs trotters to make the jelly for my pork pies in the time honoured tradition. 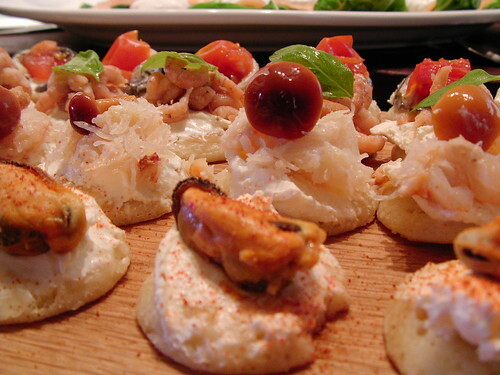 Salt cod with chorizo, a photo by rustumlongpig on Flickr. 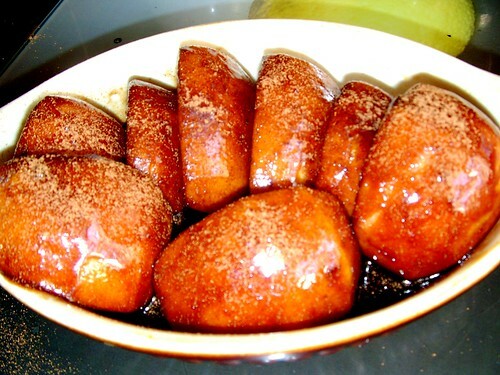 Apples Caramelised, a photo by rustumlongpig on Flickr. 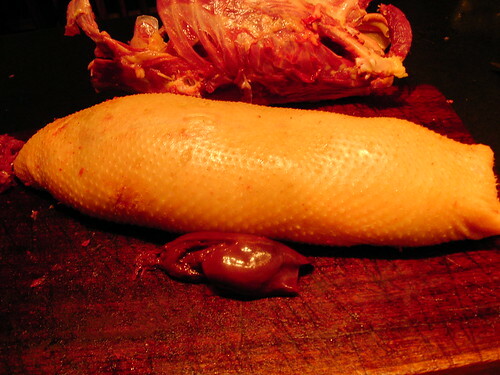 Goose ballotine filled with the macerated legmeat and chopped duck liver, a photo by rustumlongpig on Flickr. And this is the result for all the work boning out the goose the sauce worked for the gander as well!! 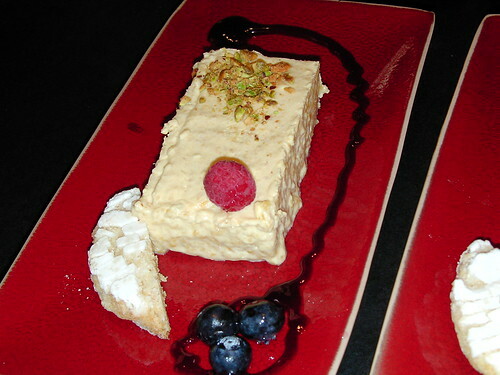 Mango semi fredo, a photo by rustumlongpig on Flickr. 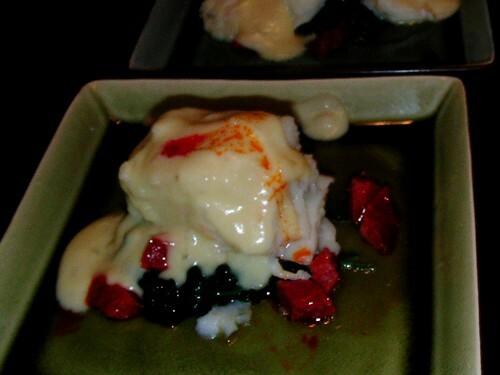 Click on this pic for the recipe in flickr. 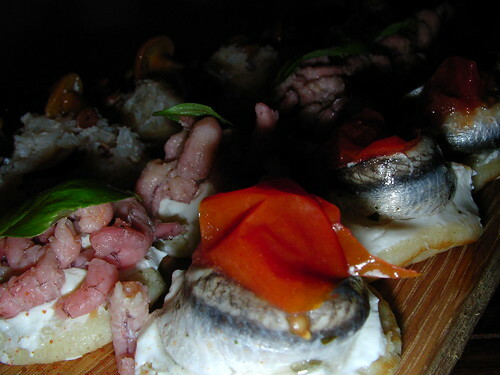 Anchovy and brown shrimp blinis, a photo by rustumlongpig on Flickr. In foil, a photo by rustumlongpig on Flickr. Rolled in foil needing two hours at 160C and 30 min unwrapped to crisp up the skin! 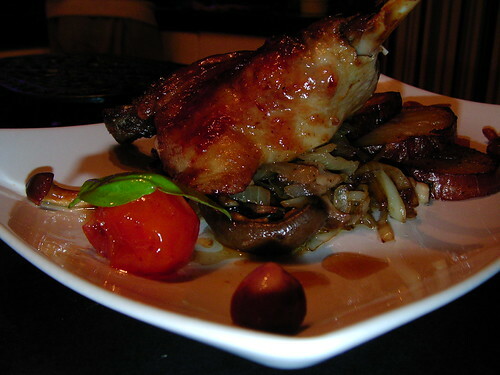 The bones were browned and a stock was produced and rendered with a slug of port to add a little sweetness. Back in the skin, a photo by rustumlongpig on Flickr. 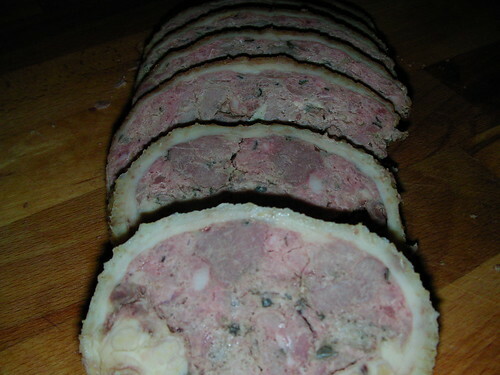 Ballotine filling, a photo by rustumlongpig on Flickr. Back into the skin to be rolled tightly. This is the meat, a photo by rustumlongpig on Flickr. Here,s the meats for the ballotine 20 gm bacon 250gm duck liver 60 gm breadcrumbs , pepper , a caramelised large onion , 50 gm butter and the goose leg meat and trim coarsely processed. and a little garlic with a tsp chopped sage. A slug of brandy wont hurt either. 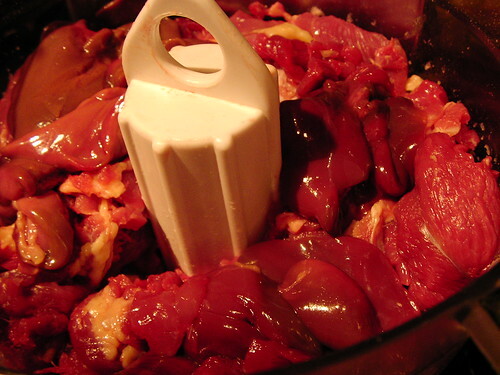 Add diced breast meat and 100gm foi gras. Goose boned out, a photo by rustumlongpig on Flickr. Need a marquee? Heres the best!! Dry ice for the gelato! Love traditional foods and creating new and fanciful combinations always learning and watching others to see their take on things I have worked as a craft baker, a butcher no candlesticks apart from the one burning at both ends ;-) And am an award winning chef Who has worked in most areas in the food industry including education and still find things to learn and see new ideas and methods all the time I have dined in many top class restaurants one of the high points being a theatrical food experience at Ferran Adria's world renowned "El Bulli" now closed for a while having wowed the world for so long.